i’ll post pictures and videos once i have a moment. getting back into real life has been a bit of a challenge, but i’m sure it’ll get easier as the days go on. i’m a little regretful that i didn’t camp near where all my friends were. i probably would have stayed until monday if i’d been with folks that i know. i’ll get over that quickly though, because i can’t change it now. finally, i can use the wacom stylus that i spent way too much on for something. i took a picture of the house yesterday morning and drew a porch on it. if it were only that easy in real life. the color is not accurate, it’s just so i can see it over the house. matt and i haven’t talked about painting yet, but i’m kind of excited to clean ‘er up and do something to make her pretty. two weeks ago i met with a lender at heartland to refinance my mortgage. i got all excited because the possibility was going to put me 9 years ahead of schedule and saving at least 140k from switching to my current 24-years to a 15-year loan. we cleaned the house. not with a fine-toothed comb, but with lots of sweat and elbow grease. the appraiser showed up in his red porsche convertible and told me about his second home in florida while enjoying a 7-minute walkthrough of the house, snapping unflattering pictures of each room. my stomach was in knots, waiting to hear from the bank. the email came on saturday at noon. thankfully, i was oblivious, and enjoying brunch at sardine with matt, josh, and claire. i’m not sure why i checked my email at 7 that night, but all i saw was the ridiculously low appraisal number. one that made it so that i would have to come up with $10k at closing. who has 10 grand just sitting around? if i had 10 grand sitting around, i would have a second-story bathroom by now. the lender thought i could put my car up against the amount while i wait for chase bank to “refund” my escrow (because i would have been switching banks), but that seems like a silly game of shells. 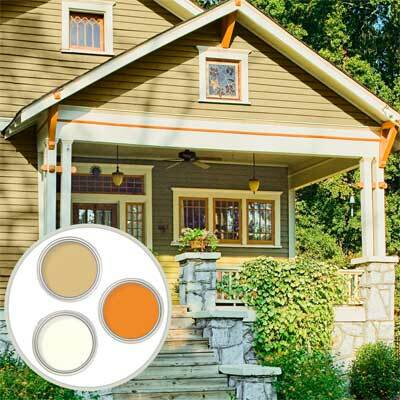 so, i’ve enlisted my pal, Judy, to help with some minor and not-so-minor updates to the outside of the house and have started looking at bungalow paint colors. so, we’re in the market to borrow a ladder to reach the top of the eaves or scaffolding if any of my readers are frequent home painters.